It's not a full-fledged budgeting app, but it's dead-simple to use. Wally+ lets you tag transactions with the friends you spend the money with, and even take a photo of the receipt to attach to the record. To create your budget, you need to add a bank account, your income, a savings account, and some expenses. Wally+ does not sync with financial institutions, so all this information has to be entered manually. Oddly, it doesn’t ask for your starting balance, but that’s what I put in the “income” field. Otherwise, your balance will reflect your next paycheck rather than what you currently have available. It’s worth noting that Wally+ is still in beta. This was most noticeable for me in the intermittent trouble it had pulling in merchants via GPS when I’d add a transaction. Each time you spend money, you add the transaction by tapping the red ‘+’ button on the home screen. In addition to adding the account and amount for the expense, you can tag a friend (such as when you meet one for lunch), choose from a location-based list of merchants, and assign a spending type (personal, social, family, or work). You can also take a photo of the receipt by tapping the camera icon at the top of the screen, and the image will be displayed at the top of the transaction record. Your most recent transactions are displayed on the home screen, along with your spending total for the current day. You can scroll through your total balance, current and upcoming monthly expenses, and your remaining budget across the top. 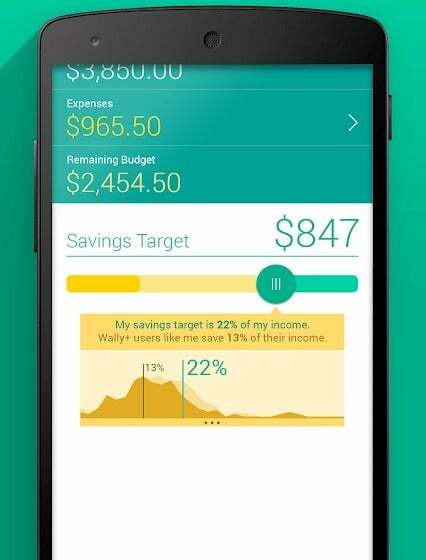 Wally+ makes it easy to assign a percentage of your income to savings. Wally+ includes a dashboard where you can get a big-picture view of your finances. Your total income, expenses, and remaining budget are displayed here, as are your individual account balances. This is also where you enter a savings target, which is shown as both a dollar amount and a percentage of your income. There’s a slider to help you fine-tune your goal: You can start by entering an amount, then move the slider until you get to the recommended 20 percent of your income. You can get a quick analysis of your spending under the Review tab. You can see a breakdown of your spending by category, location, friend, or spending type. 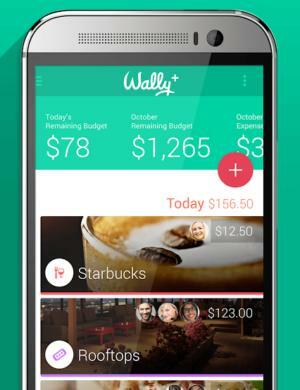 Wally+ makes it dead simple—and even enjoyable—to track your spending and savings. It’s far from a full-featured budgeting tool—you can’t set budgets for individual categories, for example—so it’s likely not the only app you need. But used in tandem with a more sophisticated financial app like Mint, it can help you make sure your money is going where you want it to.